Here are the official results of the CWCC Hillclimb. Congratulations to Josh Teasdale on winning with a new course record time and to Toby Tanfield for his huge sweep of prizes. More than covered his brothers’ DNS fees! A special mention to David Murphy too, who made the trip all the way up from Liverpool and finished a very good 7th. A big thank you to you all for taking part and to the huge crowds that assemble on the hill. You spectators are really appreciated by the riders and help to make the event what it is. Thank you also to all of my helpers, be you marshals, timekeepers, photographers or catering assistants. A photo gallery has been added (above). Click the image for a bigger version or here for a PDF copy. Thanks once again to The House designer wear of Yarm for their continued support of this event. Posted on October 3, 2016, in Club Open Events, Hillclimbs, Time Trials. Bookmark the permalink. 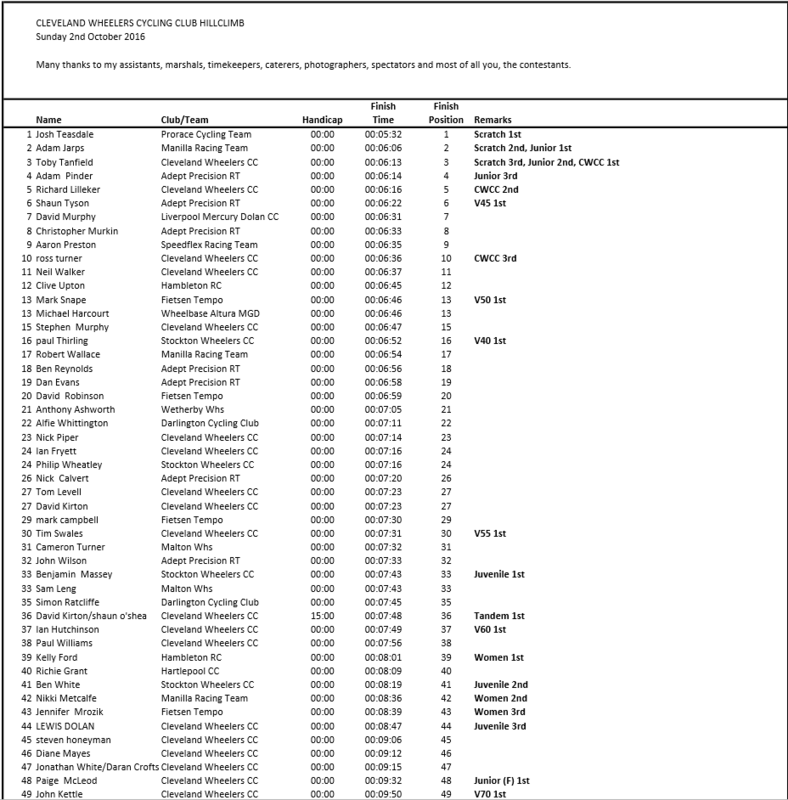 Comments Off on CWCC Hillclimb 2016 – Results (Official).